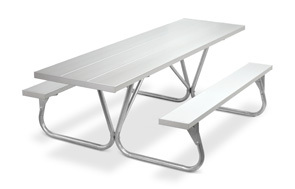 Our specially designed PARK RANGER table frame will accommodate any standard wheelchair. The underside of the table top is 29" from the floor. The seat board is 18-1/2" high, the same height as a wheelchair seat. 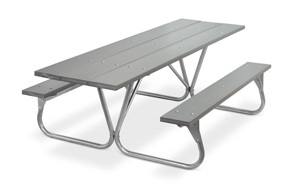 The seats are 6' long, with an 8' top providing an extension of 19" beyond each end of the frame to accommodate two wheelchairs, one at each end. 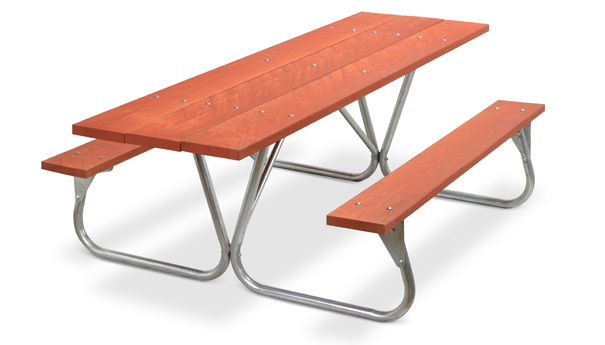 Seats and tops are available in redwood stained or MCA treated DEE grade southern yellow pine, anodized aluminum and colored aluminum. Assembly Required.